A new year means time for a bit of blogging, hopefully the present frequency of adding new stuff is not exhausting anyone. In an age where the positivistic stance has had a renaissance in neoatheistic circles, there is no lack of noise and negativity whenever someone makes attempts at integrating theological and scientific truths. If you want a calm and constructive take on this, with a kind of case study on the initiation of human spiritual life, there are worse places to look than in Denis Alexander's response to Coyne, MacDonald, Ruse, and Wilkinson. A pdf of the whole article is also moving upon the waters. Just to celebrate that I'm alive (though narrow enough mainly to materialise on my Norwegian blog), some blogs are removed (as they seem to have gone with the wind) and the blog of The GK Chesterton Society of Ireland is added. For a time containing the vast population of one member only, something that in practice means a whole universe. Ah, a Karn Evil beast. If Keith Emerson had been younger. And Norwegian. Of course Galileo Galilei has long been known to in error when backing the circular motion of the planets around the sun. However, now it seemes his own observations went against him also in other areas, as indicated by a new study using the same kind of telescope as Galileo. Galileo Galilei was right: Earth moves around the Sun, just as Nicolaus Copernicus said it did in 1543. But had Galileo followed the results of his observations to their logical conclusion, he should have backed another system — the Tychonic view that Earth didn't move, and that everything else circled around it and the Sun, as developed by Danish astronomer Tycho Brahe in the sixteenth century. In Brahe's view the earth was immobile at the centre of the universe (for alternative models, look here). The sun and moon moved around the earth, while the other planets moved around the sun. This theory was more consistent with the observational data than Copernicus' model and was highly popular in the early 1600's. It's always been somewhat of an enigma why Galileo didn't argue for - or even against - it. The article also shows the way Galileo discredited his opponents and bolstered arguments through omissions and only weakly support by data. Some data even went against him, as he kept insisting on circular motion and that the tides was due to the movement of the earth. It seems if this analysis is correct that Galileo proposed his theory in the teeth of the evidence and scientific consensus. If he is to be honored as a martyr for something it should perhaps as much be for stubbornness as for science. As this blog alternates between prog and prejudice, it's time for another go at the Medieval myths. Or science fiction writer Mike Flynn's go at "the Hole Left by the Christian Dark Ages". In general, he projects. His essay appeals to ignorance of the history of science and the scholarship of the past couple of decades, indeed, of any scholarship at all. He confuses correlation with causation. That a Christian did something does not necessarily mean that he did it because of his Christianity. He recognized this when the deed is a good one, but swallows it whole when the deed was a bad one. He also claims that Christians are guilty of "non sequiturs" when they write that various famous scientists were believers, commenting correctly that "it doesn't follow that just because a few scientists believed in God that science resulted from it." Then among his "further sources" he includes two links to surveys citing all the scientists who do not believe in God. But if it is a non sequitur in one direction then, under the gandersauce principle, it is a non sequitur in the other. In either case, it is an invalid appeal to authority. (*) Why should a scientist's beliefs about God matter any more than his beliefs about barbecue sauce or the coining of free silver? Training in the sciences tends to be narrowly focused and does not usually confer expertise in theology, history, philosophy, or indeed much of anything outside his specialty. (*) It is perfectly valid to appeal to an authority in a field; i.e., to cite an historian on a point of history; a cosmologist on a point of cosmology. This is simply shorthand for research the reader has not the time, inclination, equipment, or expertise to carry out himself. Inexplicably, Mr. Walker cites (as the bandwagon fallacy) an appeal to "the popular notion that Christianity began modern science." But this is hardly a popular notion. Most people undoubtedly buy into the cultural 'tude that Christianity was hostile to science. However, he does invite by his rhetoric that we all get on the bandwagon of advanced thinking in this regard. Here is the primary thesis of this counter-essay. Whether or not you believe in someone's God has nothing to do with whether they accomplished anything you consider worthwhile. They may have been perfectly mistaken about God and still kicked off science. But there is a certain kind of "free" thinker who seems bound to the notion that if you disbelieve in a religion then nothing that religion ever did could possibly be any good. History is never quite this cardboard stereotype of White Hats and Black Hats. Too incredible to be true, still it is written in white on blue at the ELP site and white on black at Greg Lake's. Mean Fiddler and Classic Rock Magazine are proud to announce that Emerson Lake and Palmer (ELP) will be reforming to bring the inaugural High Voltage festival to a close. Forty years after ELP opened the legendary Isle Of Wight Festival in 1970, what better act to celebrate Britain's biggest and best Adult Rock Festival. Fans can expect 'Cannons, Pyrotechnics and a supreme production alongside the stunning musicianship and songs that made ELP the legends they truly are'. The Agora movie is sure to lead to Hypatia hype, however it's presentation of Church History will also lead both to Agora- and Christianophobia. So it is not puzzling that there are symptoms of protests in some areas. Just days before the release of the new movie “Agora” by Spanish director Alejandro Amenabar, civil rights organizations are denouncing the film for promoting hatred of Christians and reinforcing false clichés about the Catholic Church. As if there is a need for such after Angels and Demons. Marcos reminded Amenabar of the comments made by people who have already seen a private screening of the film and which Amenabar himself echoed during a television interview. On the other hand, such responses may lead to an... interesting public discourse. In response to Amenabar’s statements that the film “is not against Christians but rather against those who set off bombs and kill in the name of God, that is, against religious fanatics,” Marcos wondered why the director has not recreated situations like those that take place in the Middle East. Of course, arguing against muslim extremists vicariously, through alleged Church History, is a great and traditional Western sport. Which requires far less courage. It is always good to see ELP numbers becoming jazz, rock or classical standards. Even if this is a rather typical "starting from the source for never returning". The latter half is still good in it's own Al Di Meola way. Minor luminaries such as Oscar Peterson, Art Tatum, Chick Corea, Glenn Gould, Keith Emerson, Bill Evans, Joe Zawinul, Keith Jarrett and Herbie Hancock come and go, but one keyboard artist stands head and shoulders above the rest. The genius of Scots home organ guru Eric McWhirter is renowned throughout the keyboard-playing universe, but for years, his very existence was a closely guarded secret. Click your keys and read all about it here. As not everyone subscribes to the magazine or has bought web versions of this issue of ANALOG Science Fiction and Fact, it is good news that Michael F. Flynn's short story of alternative medieval history is available here. It is about nothing less than Quaestiones Super Caelo Et Mundo. Areas that contain far more than most. 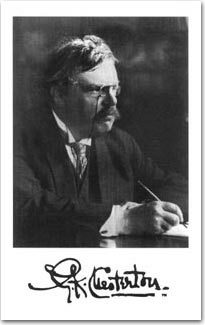 End of 'academic embargo' on G.K. Chesterton? Chesterton is so much a genius and contrarian that academia for long has hesitated even to touch him. Even if the people of England has not spoken yet, others are raising their voice. Despite having a profound influence on the 20th century, English author G.K. Chesterton has remained virtually unknown to modern readers. This discrepancy may be due to an unwillingness for universities and colleges to include him in literary and history curriculum. In short, you should ask "Who is this guy and why haven’t I heard of him?" Badblog moves from tremendous trifles to fancies and fads, not to mention alarms and discursions. And the occasional heretics and stray orthodoxy. Made in spare and stolen moments. What does "abortion is murder" mean?